The park and the fountain were an important landmark in Maud’s Deep Valley. Maud and her friends stopped to play there when they walked downtown. The Harts passed Lincoln Park every time they went downtown. Maud mentions the little park and the fountain several times in the Betsy-Tacy books. Lincoln Park, the small triangular piece of land bordered by Broad, Lincoln and Grove Streets in Mankato, was made into a park in the mid-1880s. Wishing to perpetuate the memory of the honored dead of the Civil War, the Alexander Wilkin Post, Grand Army of the Republic placed a bronze monument of a Civil War private soldier holding a musket at parade rest on a pedestal in the center of a stone basin. A dedication ceremony was held on Memorial Day, 1893 (Maud was a year old). The soldier’s monument was called the Boy in Blue. Sadly, the Boy in Blue did not remain on active duty guarding his park very long. In 1894, vandals broke off the musket he was holding. This happened again in 1911, when the musket was completely broken, and the soldier’s fingers were pried off the statue—making it vulnerable to damage from corrosion caused by moisture. A windstorm toppled the figure and it was not repaired. Exposure to the elements and neglect continued to take their toll. By 1922, citizens were asking for the fountain’s removal. In 1927, that was done. A small granite monument was installed in 1935 to replace the statue and fountain, and remains there today. 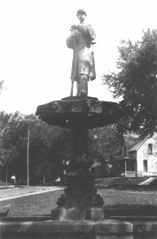 I’ve always wished the fountain was still in Lincoln Park and in 2011, along with local historian Bryce Stenzel, organized a committee to raise the funds to rebuild the “Boy in Blue”. To date we have raised $25,000 of the $100,000 needed. Construction on the stone pool base for the monument is scheduled to begin in the spring!